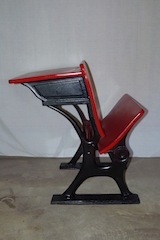 Description: Old chairs that have been given new life! Red & White fabric would add a "pop" to any room. Dimensions: (H) 37" x (W) 18" x (L) 16"
Description: Black double-legged table, paired with some funky chairs, would be a great dining room table. Distressed lightly. Has leaf insert that adds an extra 12". Dimensions: (L) 61" x (W) 42" x (H) 30.5"
With leaf is 73" long. Description: Old Windows that would make great wall hangings. Description: 8-sided Black Table. Distressed on edges, and lightly on top. It would be a great breakfast table, or work in the basement as a game or craft table. Dimensions: (W) 44" x (H) 29"
Description: Very cute & one-of-a-kind! Gray table and chairs has display of Dr. Seuss book pages. Would look adorable in either a boy or girl room! Dimensions: Table: (H) 23" x (W) 20" x (L) 20"
Chairs: (H) 22" x (W) 10" x (L) 11"
Description: Vintage Danish Modern coffee table and end table set. Beautiful clean lines true to the Danish Modern style. Dimensions: (L) 53" x (W) 18" x (H) 31"
Description: Black 6-drawer dresser with decoupaged vintage sheet music on each drawer. Truly unique piece! Could be used a buffet or baby changer as well. Drawers are on roller and move in and out very smoothly. Dimensions: (L) 63" x (W) 19" x (H) 31"
Description: This is a great old desk. It came from an old Catholic school. It would make a fantastic craft table. It has been freshly painted mustard yellow and gray. This edges have been distressed to keep with the vintage look. Dimensions: (L) 42"x (W)30" x (H) 30"
Description: Beautiful round pedestal table. 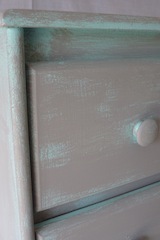 Based freshly painted white and lightly distressed. 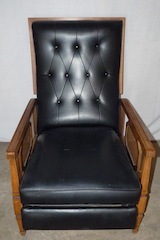 Four chairs with faux leather seats in great condition. Table can easily fit 8 if you wanted to add some cool mismatched chairs to the mix. Dimensions: (L) 30" x (H) 54"
Description: Very retro black vinyl recliner. Has some natural wear-n-tear, but still looks great and works, too. Description: Very old desk from a school. Seat folds up, and there is a small storage shelf under the desktop. Still has "character" from its students. Dimensions: (H) 27" x (W) 21" x (L) 28"
Description: End table with gold-tipped legs and gold trim. Not solid wood. 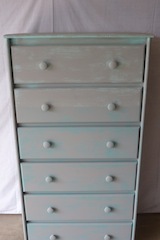 Dimensions: (H) 22" x (W) 18" x (L) 28"
Description: Chest with 6 drawers. 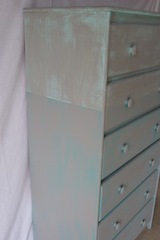 Very distressed looking, with aqua blue color beneath a light gray paint (the pictures don't do it justice). Dimensions: (H) 52" x (W) 27" x (L) 16"
Description: Retro table could be used as a side or end table. Has drawer in front. Dimensions: (H) 21" x (W) 19.5 "x (L) 27.5"